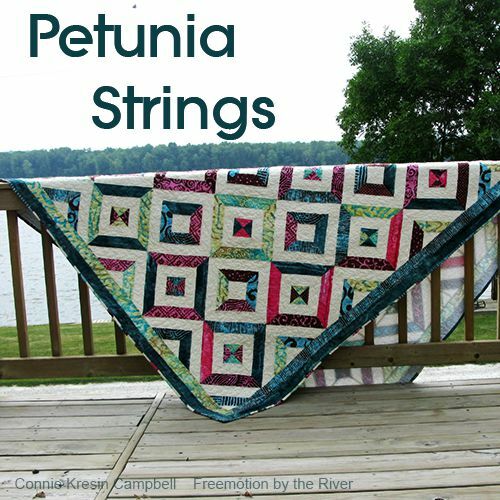 Here is my tutorial on how to make Petunia Strings by the River quilt. 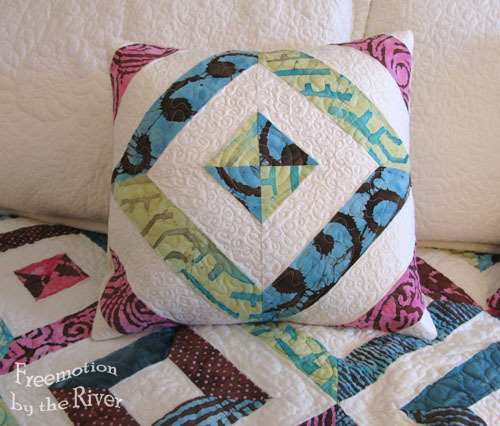 Batik fabrics really look beautiful in this easy to make string quilt pattern. If you missed the posts you can click on the links below and they will open in a new window. I used 2 jelly rolls that had 40 strips in them for my projects but you could also cut your own 2.5 inch strips of fabrics in your stash. I used a premium muslin for my solid color. 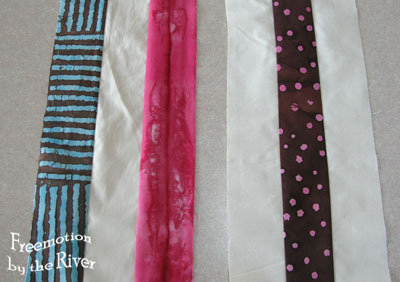 The strips are cut the width of the fabric and are about 40 inches long. Edit: I used yardage of muslin for the quilt – I just figured it out and it takes 4 and 1/4 yd – every tube uses 3 – 2 1/2 inch strips (7 1/2 inches) – you will have lots of odd pieces at the ends that can be used for other projects. Press both of these and now sew them together to make a long tube. I folded it over so you could see. We are going to make a 45 degree cut to make our blocks. You don’t need a special ruler – it does help to have a ruler longer than the width of the tube but if you don’t you could make a template. 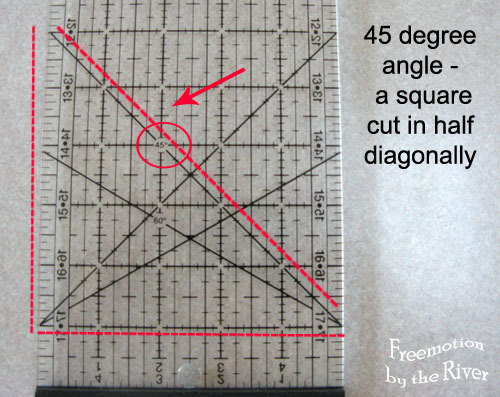 Below I have shown you what a 45 degree angle is….very easy….anytime you have a square and cut it diagonally you have made a 45 degree cut. 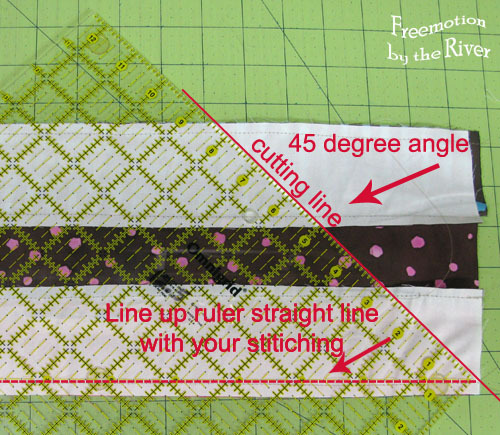 Line up the bottom of your ruler along a straight line on your seam line, you will cut along the angle as shown. 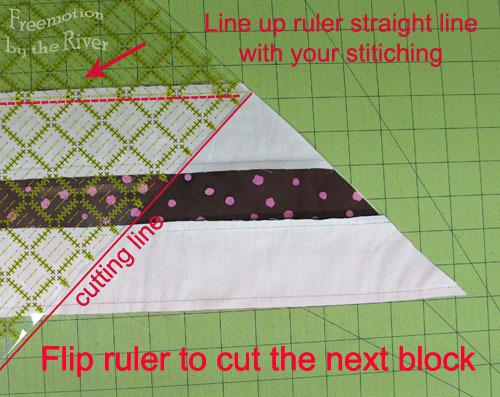 Then flip your ruler to the other side and line up along the seam line again for your next cut. My blocks are about 8 1/2 inches. Note: you could also line up along the edge of your tube…..your blocks will be bigger. Whichever way you do…..be consistent or your blocks will be different sizes. You will get 6 blocks out of one tube – it takes 4 of these blocks to make one big block for the design. You’ll have 2 leftover – hint – if you make 2 tubes with the identical fabrics you will have enough small blocks to make 3 big blocks. The next diagram shows you the fabrics I used and how they work for the corners. The strip with 2 prints and 1 solid is the one that gets used to create the center of the design. I thought I would show this picture of what happens if your fabrics are too similar. Now we will take the 4 blocks and lay them out like this and sew them together. You could also do your blocks this way…..for a completely different look. Be very careful handling your blocks as all sides are bias edges. Here is a diagram of my blocks sewn together so you can see how the blocks look in this setting. This is really a fast and fun way to make blocks and would be beautiful scrappy! 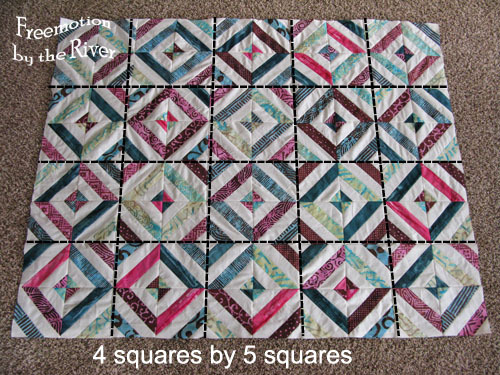 This design takes 80 small strip blocks – 4 to each large block design equals 20 blocks for this quilt. Each pillow used 4 small strip blocks. I don’t recommend using the 2 1/2 inch strips pieces for a border…..it stretched because of the bias edges on the blocks. I bought 2 jelly rolls so I could use the fabrics for a border…I just sewed strips together and added them around the sides. For my binding I cut some of the strips in half and also added some leftover pieces for a completely scrappy binding cut at 2 1/2 inches. It is a straight edge binding not a bias. I only do bias binding on a quilt with curves edges. I sewed it to the front side of my quilt after quilting and then I machine stitched it down. 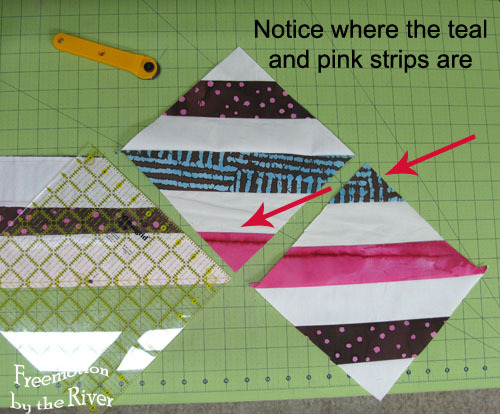 Edit: Each tube uses 3 strips from your jelly roll – you get enough blocks from one to make 1 large design block (4 small blocks) – you will have 2 small blocks leftover from each tube. 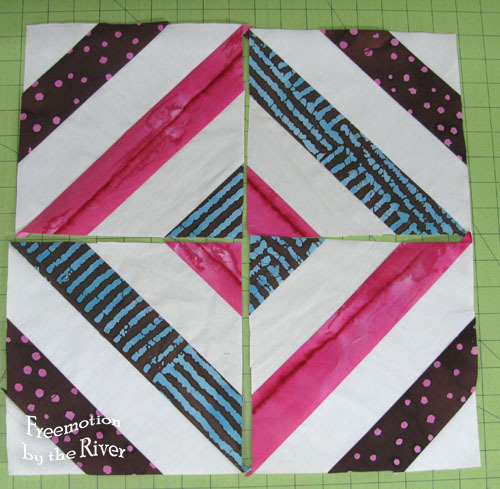 One jelly roll – using 39 strips will give you 13 large blocks and you will have 13 small blocks leftover that could be used another project or you could mix and match them. 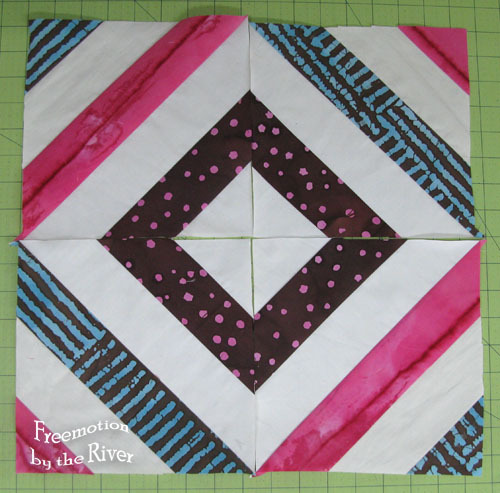 I actually used only 21 of the strips from the 2nd jelly roll for the blocks since I have 20 blocks. 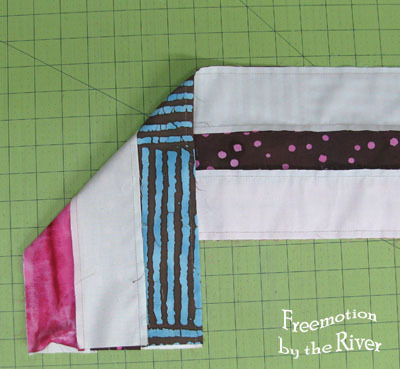 I hope you enjoyed this tutorial and make a beautiful batik strip pieced quilt! Please Note, some of the links mentioned below are affiliate links and at no additional cost to you, I will earn a commission if you decide to make a purchase. Check out the deals at Craftsy! I absolutely LOVE the fabrics you used! Great tutorial! I love this quilt. Whoop whoop!! 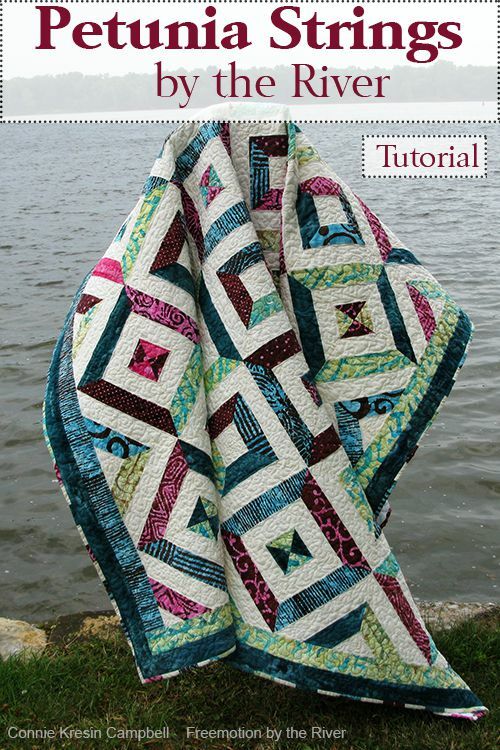 Beautiful quilt, and great tutorial! Thanks for sharing!! Very Nice this is on my to do list, I just had to pin it. Thank you for the wonderful tute on making your quilt. I love the photo of it by the water. Nice work all around. I absolutely love this quilt. You picked such awesome colors. I might just have to make one. I will put it on my bucket list. By the way, my bucket list will now stretch from here to the moon. I have to buy more paper, I used the last piece writing this down. I could now be officially called a paper hoarder with all the patterns I have copied and saved to make some day. They could probably consider this a fire hazzard. No smoking allowed, my room would burst into flames. Oh, I have gone off track again. I am so enjoying seeing all of your quilts. Now if I would spend as much time in my sewing room as I do in front of this computer reading all the amazing quilting blogs I might get to this pattern before I pass on to quilt heaven. Great tutorial! Thanks for sharing. It is going on my to-do list for sure!! Thanks for the great tutorial. The colors really make this a fabulous quilt. I ♥ stripping! Makes things LOOK like you spent hours piecing!! This layout is really pretty. I'm working on a similar one now…I used a whole piece of white (or cream or white on white) paired with strings. When I opened the block up, it looks like a giant half-square triangle & I've got them laid out so the strips line up diagonally. Took longer to make all the strings than it did to cut all the blocks! Thank you, thank you, thank you Connie — I LOVE this quilt ! 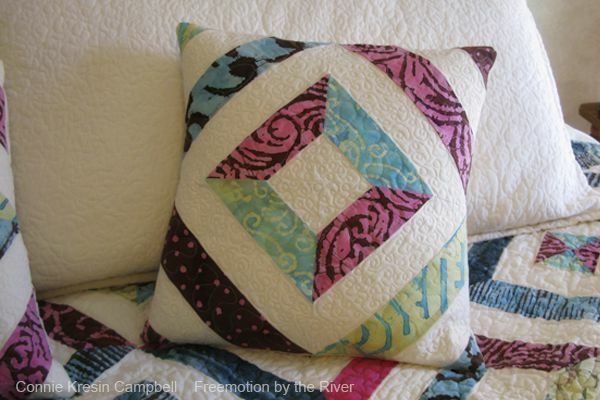 This quilt is beautiful, I never would have thought of doing it with a tube. Thanks for sharing! This is on my to-do list now! Very nice, Connie. I haven't tried this yet, but I'm gonna! Thanks for a great tute! Such a great tutorial. Thanks for sharing it!! I love strip tubing techniques. Thanks for sharing. 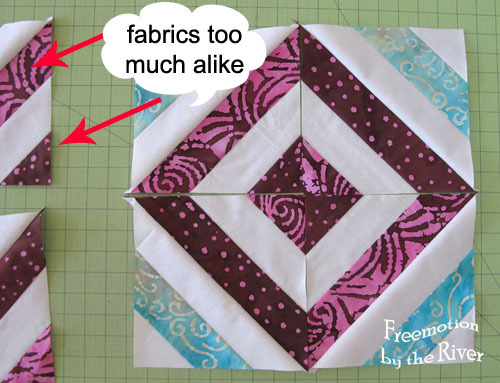 Great tutorial and great quilt. It is on my To-do List! Thank you for the wonderful tutorial. I do have a question: when you say you used 2 jelly rolls, was that 1 print jelly roll and 1 solid jelly roll or 2 printed jelly rolls and yardage of the solid? I hope this makes sense! ha! What a great tutorial! Thank you so much. The quilt and pillow are so pretty! Beautiful quilt. Your tutorial was easy to follow, your pictures were very helpful. This quilt idea is definitely on my bucket list. Thank you for taking the time to post a most excellent tutorial, Connie. Connie, I'm trying something out – I hope you can reply to my comments now. Awesome! Thanks for the clear instructions! This will be new for me! Thanks Connie! Great job on the tute. I love the colors you picked to make this one. Thanks so much for the tutorial. Is that a 40 piece jelly roll or a 20?